WHAT IS A PLANT ZONE? 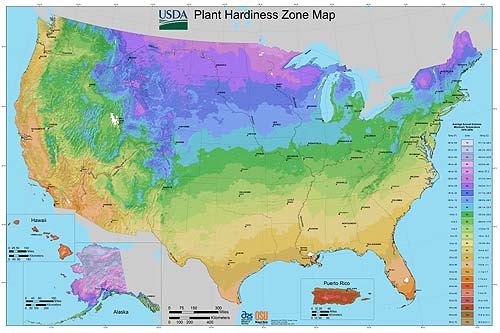 Plant zones are also called Hardiness zones. Basically it’s the temperature at while a plant will survive the cold. Decades of observation and experimentation have shown what temperatures each plant will live, thrive or die in. The United States Department of Agriculture (USDA) first developed this method but it has since been adopted by many other countries. What they did was divide the country up into bands of average temperatures so for example zone 7 would be from 0°F (17.8°C) to 10°F (12.2°C). These are the average low temperatures for that area. Of course then it got more complicated and they decided to have 7a and 7b which breaks the zone down a little more finely. Every plant grows within a certain temperature range is assigned to a the lowest zone in which it will survive. That does not mean that it will flourish wonderfully there but it will survive. When you look at buying a plant most growers and seed companies will list what zone the plant is hardy to. Using this information along with which zone your home is located in you can determine if a specific plant will grow in your area. The USDA has an excellent website with country wide maps and state maps. You can even put in your zip code and it will tell you what zone you are in. The climate zones were updated in 2012 to take into account the warmer temperatures that the world has been experiencing in the last two decades. So if you thought you knew what your zone was it’s a good idea to check it again as it might have changed now. Our zone went from 6a to 6b and then on the latest update to 7a with the ever changing maps its looks as if we are creeping closer to 7b! Other countries have also adopted the USDA idea and have produced zone maps for their own countries. If you search for hardiness zone and your country you should be able to find it. Higher Or Lower Zone Which Is It? This can be very confusing. Higher zones refers to a higher number so its hotter. Zone 10 is higher than zone 6. It does not refer to the location on the map so although Maine is ‘higher’ up in the United States it has a low zone number. Cold Is Not The Only Thing That Determines Plant Growth . More recently it has been recognized that cold hardiness is not the only factor that should be taken into account when growing plants. Some plant can’t tolerate heat. Examples would be Maral root which is a Siberian native and wont grow in warm climates. Rowan trees are another example they cant tolerate high heat. I have seen magnificent rowan trees in Nova Scotia and Maine but I cant grow them here its too hot. To that end the American Horticultural Society have created a heat zone map and thousands of plants have been coded to it. Unfortunately since this was created by a non-government body the map is only located on their site and its quite small. If you want more detailed information they ask you to purchase one of their maps. The small map they show is fairly valuable at determining your zone and their site does explain its use in detail. The only drawback is that most nurseries do not code their plant labels to use the heat zone map so you need to look the plant up on the AHS site or a few other sites that do reference this map. 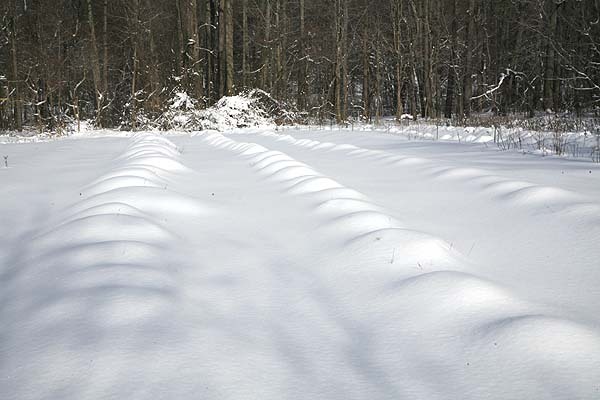 Plants covered by snow are insulated from the cold air temperatures above. Less borderline plants will die if covered with snow all winter. Snow cover is also a factor. Snow is a great insulator. If plants are covered in a thick blanket of snow from early winter until the spring they will often survive in lower zones than it is listed for because it was kept warm by the snow all winter. In areas where the snow falls then melts then falls again the plants are subjected to a far more extremes of temperature and need to be much more hardy than in areas where snow persists all winter long. We certainly tend to loose more plants in winters that are very cold when the snow falls and melts than when we have a blanket of snow all winter long. For the most part perennial plants are always listed with a hardiness zone on the label. Annuals are not since they are expected to die at the end of the season anyway. However many plants that are treated as annuals are not really. A good example is Impatiens which are grown in a large portions of the country since they can tolerate some shade. These plants are treated as annuals and left to die at the end of winter, however they are in fact perennials but they don’t tolerate low temperatures. Brought into the house they will live happily as perennial house plants. Always check the label for the plants zone. All the perennials that we sell at Floral encounters have a zone listing with them. Make sure to check the zone listing on any plants that you purchase at your local garden center. Just because they are selling it there and its outside in the summer months does not mean that it will survive the winter months there. Its quite common for garden centers to sell plants that will not survive the winter but neglect to tell the buyer this when they purchase the plant. Always check the label, if it does not say on the label, but cautious it often means it won’t survive winter in your zone. Author Janice Hazeldine PhDPosted on February 16, 2017 February 10, 2017 Categories garden concepts, Garden workTags cold hardiness, plant hardiness zone, plant zones, will my plant grow here, will my plant survive hereLeave a comment on WHAT IS A PLANT ZONE?